Well designed meat processing workstations are an ideal solution for combining operations, reduce waste, reduce labour and increase productivity. 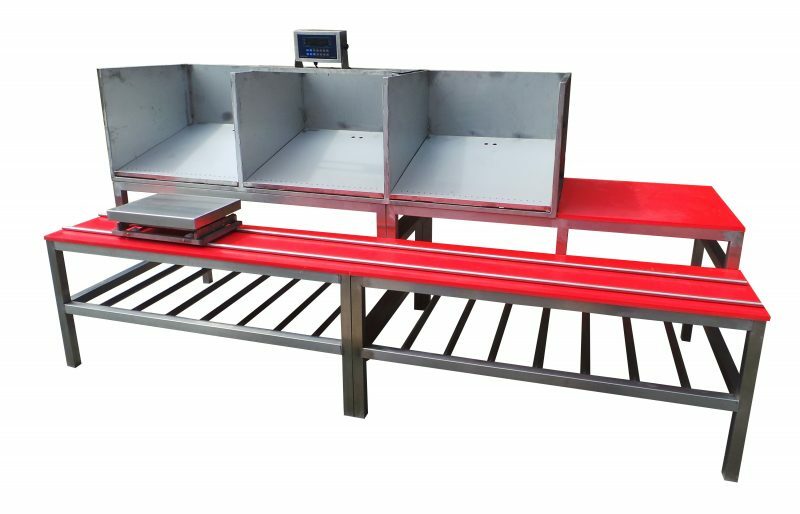 Designed with you to suit your individual requirements and manufactured using traceable food grade materials, including grade 304 or 316 stainless steel with options for durable polyethylene processing services and incorporation of weighing systems. Designed and manufactured for use in even the most arduous of processing and wash down environments. As a UK manufacturer committed to providing quality, durable equipment, working with customers over the long term to produce well manufactured lean production workstations and automation equipment, with the main goal of increasing customer productivity. The workstation shown is designed so one member of staff can collate, grade and weigh four cuts of beef, collating the product into specific weight bags and packaging boxes to maximise productivity. The unit allows for draining of excess liquids along with storage of packaging. The weigh scale simply slides down to the required position reducing additional associated costs. The full unit is easily diss assembled to allow cleaning. All spaceguard equipment comes complete with product manuals including food safe information on direct contact surfaces. UK Manufacturers of Lean food work workstations along with food processing conveyors and equipment.